Dream of exploring Huelva freely? With our car rental Huelva or Huelva Train Station or other location in the list below you can do this! We are checking hundreds of car rental companies in 30,000 world locations to find only the best car rental prices, reliable car hire services for you. You don’t have to compare car rental prices anymore - we’ll do it for you! Make a perfect deal with car rental Huelva! And be ready, in Huelva you might feel like you're in Victorian England! 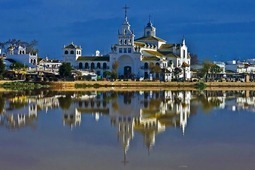 Our car rental services will open the secret of Huelva’s unique charm with its narrow streets, palm areas, historical monuments and an incredible assortment of seafood on the menu bars and restaurants. The heart of Huelva is its central square - Plaza de las Monjas. Driving around the city center you will see both architectural monuments and designer shops. RentalCars24h.com offers you reliable car rental Huelva services that will help you to feel free and independent when moving around the town. Providing best online prices for car hire Huelva services, RentalCars24h.com allows you to save money each time when you rent a car in Huelva.